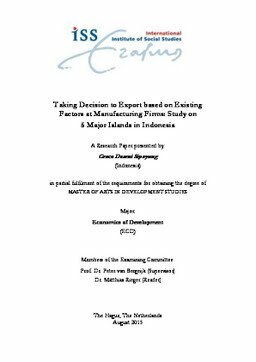 This study is required to capture what factors in the manufacturing firms in Indonesia that make them choose to export or not, and how the influence of factors proficiency level on export activities. Using data at the enterprise level, obtained from the Central Bureau of Statistics through surveys that they do, then obtained variables as follows: export proportion (as the dependent variable), then the firm productivity, firm size, firm capital, firm age, foreign ownership , and the area of the firm (independent variables). The data used are also using data from 2006 to 2011 using 48.134 observations, based on 5 biggest island in Indonesia. Regression analyzes were performed using binary logit, and to know how much percentage of goods exported by using tobit models. The result is that a significant factor, and positively influence the company's decision to export and the percentage of exported products is the productivity of the company, the company's ownership by foreigners, as well as the capital of the company. For a company, the size and age of the company have varying results, and not entirely significant in both models. Factors area companies also considerably stimulus the proportion of exports.